Since January 1, 2008, NJ has had 4,930 MMA contestants compete in agency regulated bouts. 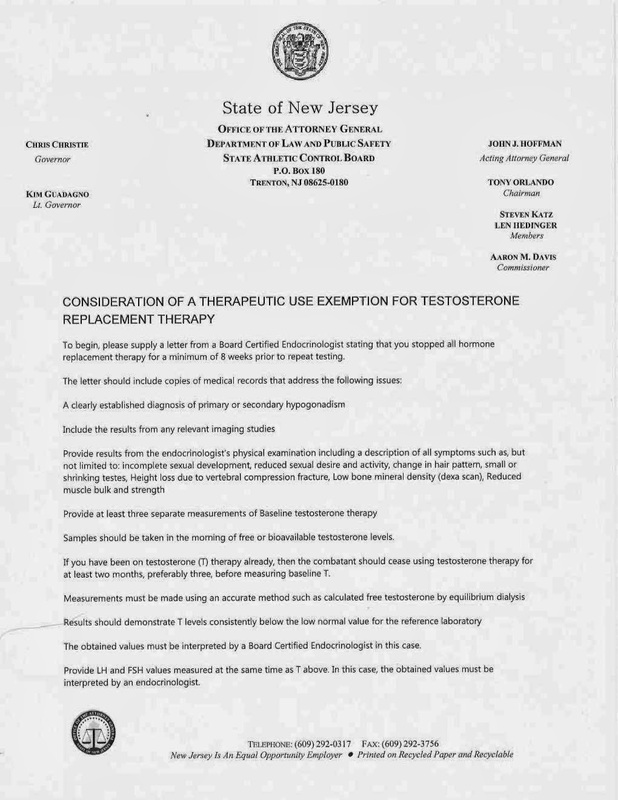 The New Jersey State Athletic Control Board has only granted one initial TRT therapeutic use exemption of those 4,930 MMA contestants. That one exemption was subsequently revoked when that individual failed an agency required random monitoring test several months subsequent to his NJ bout contest date. The NJSACB has also honored exemptions to two of the 4,930 MMA contestants based on exemptions originally granted in multiple other jurisdictions and after additional testing and board certified endocrinologist documentation was supplied. The NJSACB has refused TRT exemptions to over a dozen applicant contestants. 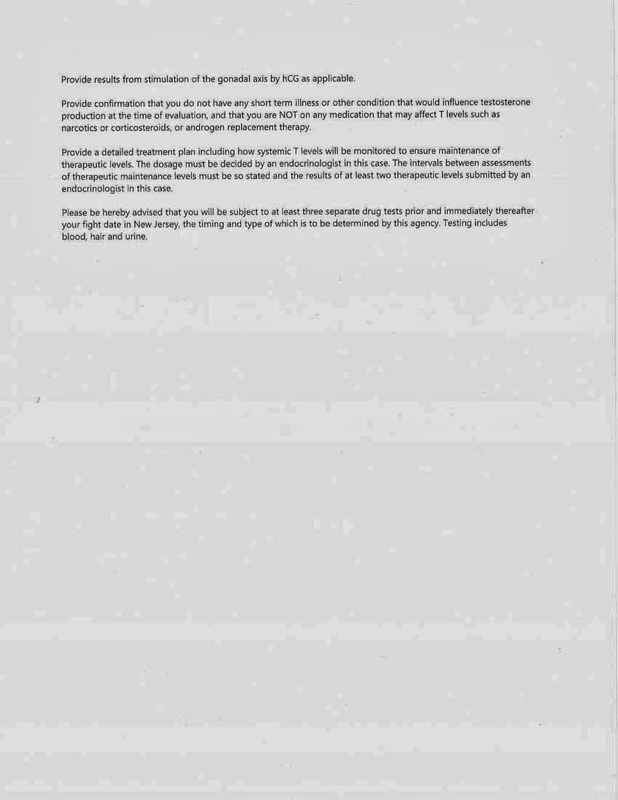 In addition, the NJSACB has never granted a TUE for TRT to any of the multitude of professional boxers, Thai fighters or kick boxers subject to its purview. At this juncture, the NJSACB will continue to adhere to the very strict International Olympic Committee therapeutic use exemption standards. Based on the IOC poilcy, the ABC medical committee set forth and published extremely rigorous guidelines for the consideration and granting of TUE's during its presentation to the ABC membership at the July 2011 annual convention. That being said, we will consider Nevada's decision today and look forward to discussing how to handle the rare candidate who indeed has a true legitimate medical reason for usage. As examples, an individual returning from military duty who has suffered testicular malfunction from an IED explosion, those with pituitary giantism, testicular cancer survivors, and transgender contestants. We hope that all MMA contestants are subject to repetitive and efficient drug testing protocols without regard to whether a TUE for TRT is at issue. I think we can all agree, regardless of positions on TUE's, that performance enhancing drug testing needs to be analyzed, implemented and continually improved. As a reference point, I have attached the current NJ TRT TUE consideration requirements which mirror the ABC medical committee guidelines.